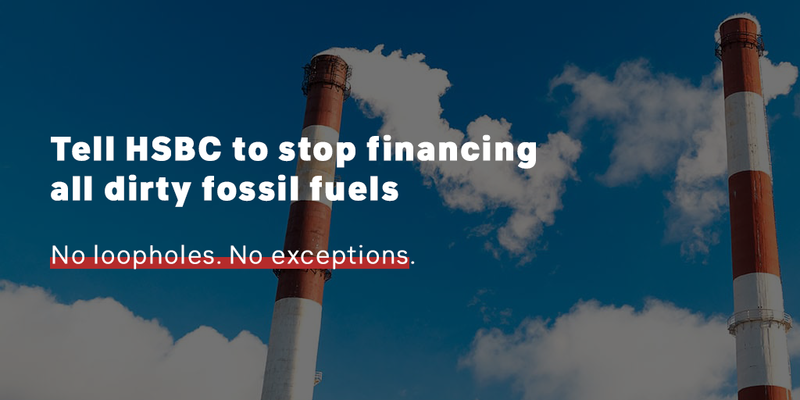 In 2018, HSBC announced a partial ban on financing new coal power stations. But a partial ban isn’t enough. This unfair policy will intensify climate change and expose communities in Bangladesh, Indonesia, and Vietnam to dangerous air pollution. HSBC has also been found financing the military-industrial complex. While pouring over £43bn into the fossil fuel industry, HSBC has also invested tens of billions in arms companies. Our struggle for peace and climate justice are inseparable. HSBC must stop financing dirty energy projects everywhere and cut its business ties with companies that sell weapons and other technology used in war crimes and violence around the world. Whether it’s supporting arms sales or financing the extraction of fossil fuels, HSBC is profiting from death and destruction. There is deep history between state-led violence and the extraction of fossil fuels, one that spans from Western colonialism to now. The arms industry is central to this history, as selling weapons builds the capacity for violence and repression of resistance. We see it in fossil fuel rich countries all over the planet: a domestic or foreign government arms themselves so that they can secure resources for fossil fuel companies. The violence enacted on behalf of these governments and companies has displaced communities and destroyed families across the planet, a situation that will only worsen as the extraction and burning of fossil fuels exacerbates the impacts of the climate crisis. As we witness the worsening impacts of climate change, the deep interconnection between the struggles against a warming planet, and the struggles against all forms of oppression, is more evident than ever. Peace and stability can only come both when fossil fuels are left in the ground and when there is multilateral disarmament. HSBC is directly connected to this history, financing the exploitation of people and the planet through its loan book and its investments. In the last three years alone, the bank has poured over £43bn into the fossil fuel sector. At the same time, HSBC has invested over £830m in arms companies and has been involved in syndicated loans exceeding £18.9bn. We are anti-militarism and climate groups who recognise the inseparable nature of our struggle for peace and climate justice. Together we rise to demand that HSBC cut its business ties with companies that sell weapons and other technology used in war crimes and violence around the world, by Israel, Saudi Arabia and other states waging brutal wars on civilians. Financing arms' companies makes HSBC complicit in war and human rights abuse. Together we rise to demand that HSBC end loans to coal power projects and to companies that are heavily reliant on coal, the most emissive of all fossil fuels, responsible for 800,000 pollution-related deaths every year. Together we rise to demand that HSBC ends its financing of new and existing fossil fuels, driving us further into the climate crisis that is devastating our communities and our planet. These demands, if taken by HSBC, will be the bank’s first step in ridding itself of its connections with death, oppression and the destruction of our living planet. Thank you for supporting this campaign! The more people are behind this issue – the more likely it is that HSBC will pay attention. Can you help spread the word by sharing this with your friends and family? The science is clear. Any new fossil fuel project is incompatible with a safe climate.